Video by Robert H Kelly, Copyright 2018, All Rights Reserved. PISCATAWAY, NEW JERSEY (August 11, 2018) With a brace by Rachel Daly (shown right, No. 3), the Houston Dash picked up their sixth win of the season with a 2-1 win over Sky Blue FC on Saturday Night. The 2,126 fans in attendance at Yurcak Field saw Daly score her first goal in the match in the seventh minute, off a corner kick from Kealia Ohai. Sky Blue evened the score 57 minutes later on a Madison Tiernan goal, with Daly securing the brace in the 73rd minute from a penalty kick. The two scores pushes the defender's total to nine in 2018 and ranks her fourth in the NWSL. Three players are ahead of her with 10 each. The next game for Houston is a Friday, August 17 match against the Washington Spirit. The Dash and Spirit have met twice previously this season; with Houston coming out on top in both matches; on May 27, Houston secured a 3-2 at home, along with a 1-0 road win on July 21. WACO, TEXAS (August 8, 2018) Post Oak Little League (Houston, Texas) is headed to Williamsport, PA and the Little League Word Series with an 8-0 win over Tulsa National LL. Post Oak outscored their opponents in Waco (at the regional) 43-5. The Little League World Series will kick off on August 16. PRAIRIE VIEW, TEXAS (August 8, 2018) Like sands in the hour glass, time continues to move forward as the Prairie View A&M University football team has reached the midpoint of 2018 Training Camp. Coverage of Panthers Training Camp on pvpanthers.com is sponsored by Texas Farm Bureau Insurance. Texas Farm Bureau Members can receive free tickets to Panther home athletics contests by showing proof of membership at the PVAMU Ticket Office. Panther Nation can visit the local Texas Farm Bureau Agent in Waller to become a member today. Having reported to camp approximately two weeks ago, and with the August 25 season opener at Rice approximately 2 1/2 weeks away, first-year head coach Eric Dooley likes the way his roster is shaping up. Gameday is steadily approaching. Positions on the roster and depth chart battles continue daily. As camp pushes on, Dooley continues to look and establish a roster which will compete for 60 minutes in every play of every game. The Panthers will practice Thursday at 9 a.m.
HOUSTON, TEXAS (August 6, 2018) Pitch 25, the brainchild of Brian Ching of Houston Dynamo fame, hosted the Houston Dash’s annual Meet the Team event for season ticket holders on Monday night. 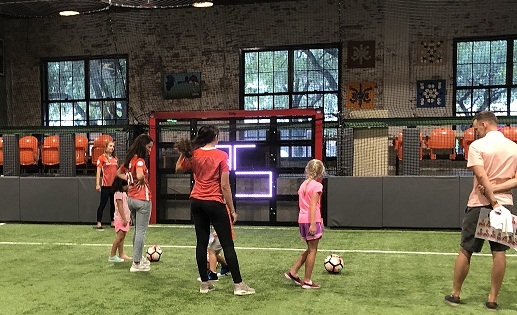 Against the backdrop of an indoor mini-soccer field, fans could interact with their favorite Dash players. They had stations for autographs, a chance for kids to play soccer with professional players, as well as stations for photos. The entire roster was on hand including the Dash coaching staff. Allysha Chapman stole the show with her picture posing ability and was having a great time interacting with the young kids that were there. Eddie Robinson, assistant coach for the Dash, was milling about speaking with season ticket holders and having a blast at this family friendly event. The Dash are back in action on Saturday, August 11th when they travel to play their former teammate Carli Lloyd and FC Sky Blue. That game starts at 6:00 P.M. and will be broadcast on the NWSL’s website. The Dash need to win this game to keep them in the hunt for a coveted playoff spot. 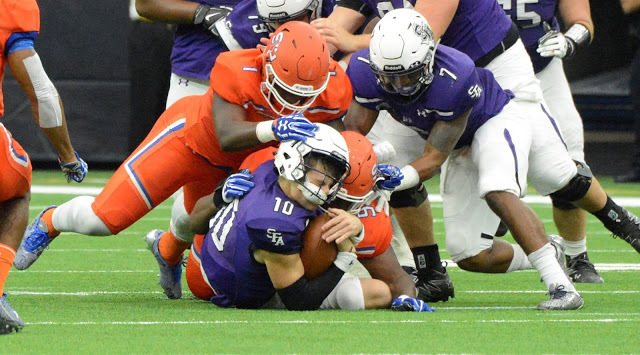 SHSU may have to face James Madison and North Dakota State in possible 2018 playoff run. hope to continue their winning ways in 2018.
two teams are the James Madison Dukes and the North Dakota State Bison. These two teams battled for the national title in 2017, with the No. 2 Bison downing the No. 1 Dukes 17-13 in at Toyota Stadium in Frisco, Texas on January 6, 2017. The Bearkats have faced both the Bison and the Dukes in past playoff appearances; with the latest coming in 2017. In the semi-final game on December 15, North Dakota State gave Sam Houston their second defeat of the season, with a 55-13 effort, knocking them out of the playoffs. The Bearkats have made 11 appearances in the playoffs, including a 2016 run, where they advanced to the semi-finals; dropping a 65-7 decision to James Madison. The Dukes when on to win the national championship with a 28-14 win over No. 13 Youngtown State. Sam Houston is returning 14 starters from 2017, including seven on each side of the ball. Seven players were named to the preseason All-Southland team, including five on the first team. They kickoff their season on Saturday, September 8 against Prairie View A&M. James Madison is picked as the favorite in the Colonial Athletic Association, receiving 21 of 24 first-place votes. JMU had won a program and CAA-record 26 straight games between the 2016 and 2017 seasons, which ranks second all-time in FCS history. North Dakota State returns 13 starters from their 2017 team that won the national title. The Bison have won six FCS championship in the last seven years and are a favorite to win in 2018. In fact, The North Dakota State in ranked No. 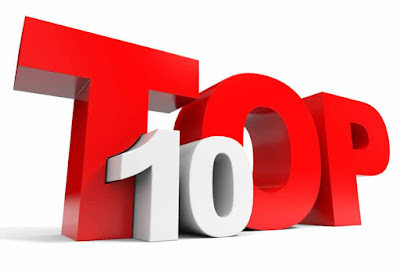 1 in final FCS Coaches poll (January 9, 2018), followed by James Madison and Sam Houston State. In the STATS FCS Top 25 ranking (August 6, 2018), SDSU is ranked first, JMU is second, with SHSU placing fourth. The previous two years, James Madison and North Dakota State ended Sam Houston State's playoff run. If history is any indication of things to come, the Bearkats will likely face one of these two teams in the 2018 playoffs. HOUSTON, TEXAS (August 5, 2018) The Houston Dash finally broke their 2018 scoring drought against Utah Royals FC on Sunday evening. Forward Veronica Latsko did what she has done twice previously this season. However, the goal was not enough, as the Dash dropped a 2-1 decision to Utah at BBVA Compass Stadium. It was the third goal of the season for the rookie, who played her college soccer at the University of Virginia. She was selected by the Dash as the 38th overall selection in the 2018 NWSL College Draft. Huerta's assist was her third as a member of the Dash. She has two additional assists in 2018, as a member of the Chicago Red Stars. Both the Royals' scores came in the second half. Christian Press scored in the 77th minute, followed seven minutes later with a Katie Stingel goal. They will return to BBVA Compass Stadium on Friday, August 17 to host the Washington Spirit. In two previous meetings this season, the Dash came out on top; a 3-2 decision on May 27 and a 1-0 win on July 21. HOUSTON, TEXAS (August 5, 2018) On a humid Sunday evening in Houston, the Houston Dash (6-5-7, 23 points) host the Utah Royals (5-7-6, 22 points) at BBVA Compass Stadium in a crucial NWSL match up. The match will also serves as the inaugural Salute to Women Veterans' night, hosted by Sasol. Utah is yet to concede a goal to the Dash through their first two meetings in 2018. On March 31, the two squads battled to a scoreless draw, with their second meeting on May 19, resulting in a 1-0 win for the Royals. Houston has scored in nine consecutive games this season, which is a franchise record. The last time the Dash were held scoreless was the March 31 loss to Utah. The Royals have just one of their last seven games (four losses and two draws) and have been held scoreless five time during that stretch. They are currently in seventh place in the NWSL standings, one spot behind Houston. The Dash will look to forward Kealia Ohai for her continued success in 2018. The 24-year-old has converted 19.1% of her shots this season, including blocks, which ranks her third in the league among players with at least four goals this season. Kickoff is set for 7:30 p.m. CDT in Houston. 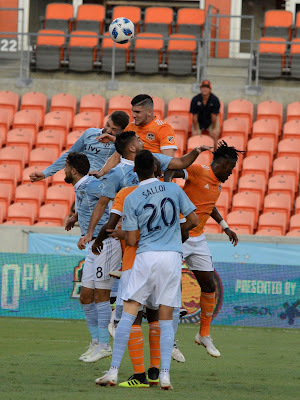 HOUSTON, TEXAS (August 4, 2018) The Houston Dynamo hosted Sporting Kansas City at BBVA Compass Stadium on Saturday night. The meeting was the third match of the season for the two teams and lived up to the promise of the tight scoring, hard fought game. Sporting Kansas City controlled the ball 61% of the match compared to the Dynamo’s 39%. Unfortunately, neither team had the opportunity to get into a rhythm they wanted due to fouls and cards being issued. Both teams exhibited strong defensive plays that kept the game to a low score. The match saw some milestones including Sporting Kansas City’s 16 year-old Gianluca Busio who made his MLS debut on July 28th. Unfortunately the game was also filled with yellow and red cards as well as the ejection of Dynamo head coach, Wilmer Cabrera. 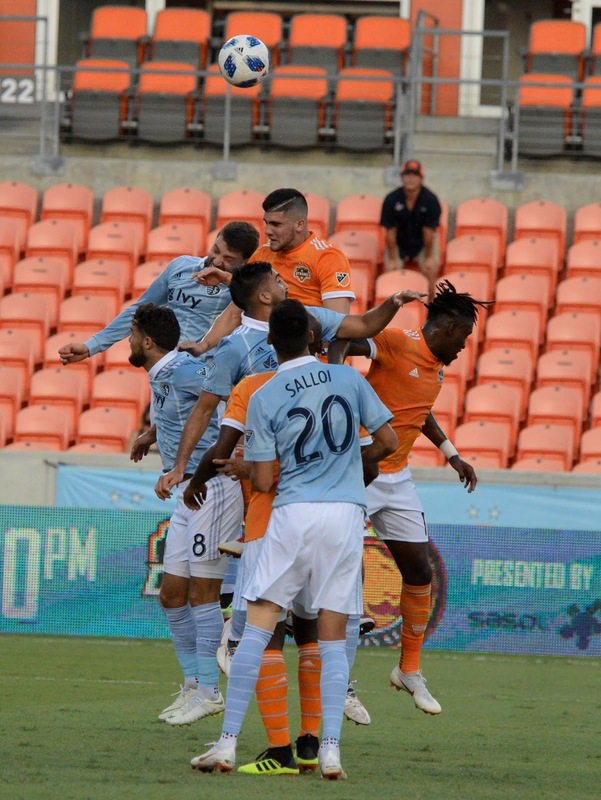 A red card was shown in the fourth minute to Dynamo centerback, Alejandro Fuenmayor, who jumped to head the ball at the same time as Sporting Kansas City’s Gianluca Busio. The card was given for the hit between Busio’s shoulder blades. This card lead to a yellow being issued to Dynamo’s Alberth Elis for arguing the red card that was previously issued. Immediately after these cards, Dynamo goalkeeper, Joe Willis made a tremendous save in the goal box to keep the game scoreless leading into halftime. Assistant head coach Michael Dellarusso assumed coaching responsibilities for the remainder of the game. The game took on an air of frustration from both sides as they jockeyed to swing the momentum to their way. That was not going to be the case for either team. Goalkeeper Joe Willis was issued a yellow card for arguing with the on-field referee over the missed call on Elis. This frustration lead to Sporting Kansas City scoring the only goal of the night off the foot of Diego Rubio in the 74th minute. Once that goal was scored, a collective 5 cards were issued; 3 yellows and 2 reds. Yellow cards were issued to SKC’s Diego Rubio and the Dynamo’s Ronaldo Pena and Leonardo. Red cards were issued in stoppage time to the Dynamo’s Darwin Ceren for putting hands on a SKC player. Consequently, chaos reigned on both sides resulting a pushing, shoving and shouting match between the two teams and Alberth Elis received the final red card of the night. 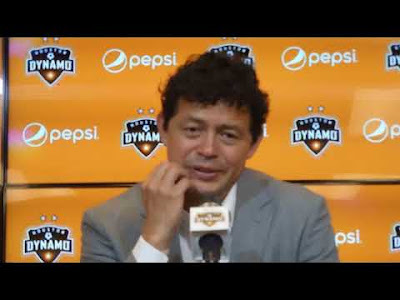 In the press conference following the game Wilmer Cabrera said, “You cannot let that happen” when he was asked about Ceren’s and Elis’ actions.Cabrera also stated his team is, “against the wall” regarding the Dynamo’s potential playoff spot. This creates a jam for the Dynamo, as now Elis is suspended for the next game for excessive yellow cards and still must serve the red card suspension. He will serve the red card suspension alongside Ceren and Fuenmayor. The Dynamo return to action at BBVA Compass Stadium on Wednesday, August 8 in the semi-final of the U.S. Open Cup against Los Angeles FC. other on July 18 during the U.S. Open Cup. HOUSTON, TEXAS (August 3, 2018) The Houston Dynamo will square off against their long time rival, Sporting Kansas City on Saturday, August 4, at BBCA Compass Stadium with a scheduled 8 p.m. CDT kickoff. Houston looks to capture the 2018 season series against Kansas City, with each team winning one game in the first two meetings. The Dynamo are four points out of a MLS playoff spot with 13 games remaining to play in 2018. The rivalry between the two teams includes five playoff meetings and five matches in U.S. Open Cup action. TexSport Publications Special Correspondent for Soccer, Jennifer Edwards (shown left), will be on hand to report on all the action live from BBVA Compass Stadium. 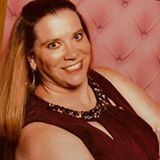 Jennifer has followed soccer extensively at all levels from age group and high school, to the professional level, including the national teams and World Cup level. You can follow Jennifer's live game commentary on Twitter at @JenCris38. 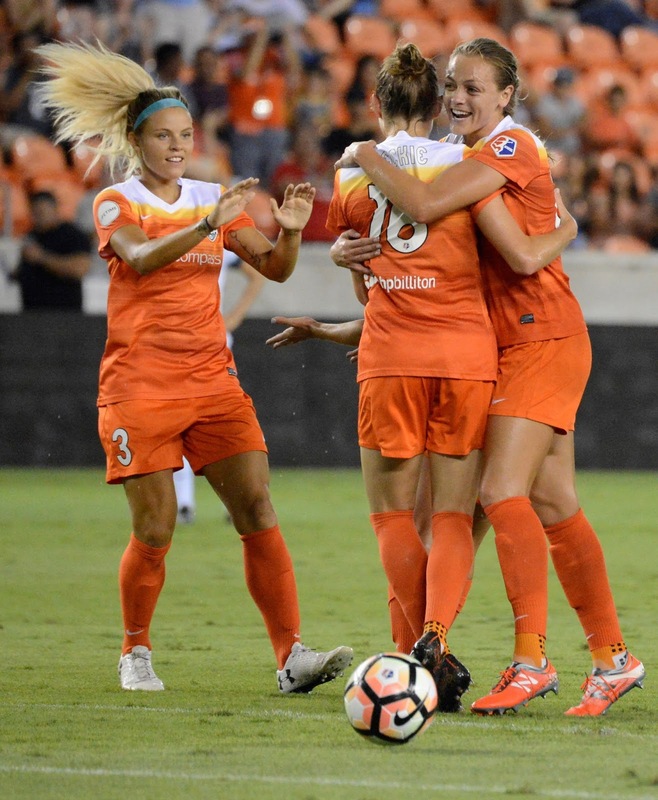 HOUSTON, TEXAS (August 4, 2018) Houston Dash forward Rachel Daly (number 3, shown right) was named to the NWSL Team of the Month for July by the NWSL Media Association, the league announced earlier today. The forward earned the honor after scoring three goals in the month, including two game-winners, leading the Dash to a 2-2-0 mark in July. This was the third time Daly has been named to the Team of the Month this season after key performances in March and May. The Harrogate, England is the first Dash player to earn the award more than once in the same season since it was first handed out at the beginning of the 2017 season. The striker scored two goals in a 3-1 victory over the Orlando Pride on July 11. FW Kealia Ohai sparked a fast break that lead to Daly's first goal of the evening after she beat Pride GK Ashlyn Harris with a curling shot to the inside of the far post. The third-year veteran then scored the game-winning goal minutes into the second half. After her effort was cleared by Harris, Daly followed up on the rebound and struck the ball mid-air to beat the Pride goalkeeper at the near post. Daly scored her second game-winning goal of the month in Houston's 1-0 victory over the Washington Spirit at the Maryland SoccerPlex on July 22. MF Sofia Huerta found the forward inside the box in the third minute of the game and Daly reached the ball just before a lunging effort from Spirit goalkeeper Aubrey Bledsoe for the only goal of the game. With the three goals in July, Daly has now scored seven times in 2018, surpassing her previous single-season career high of five set last season. Daly, Huerta, Ohai and the Dash return to league play on Sunday as they host Christen Press, Becky Sauerbrunn and Utah Royals FC in the club's inaugural Salute to Women Veterans game, presented by Sasol. A special Salute to Women Veterans ticket package is available and includes one ticket to the game as well as a $5 donation to Trauma to Triumph - The W.A.V.E. Campaign, aimed at supporting homeless women veterans in Texas, for only $19. 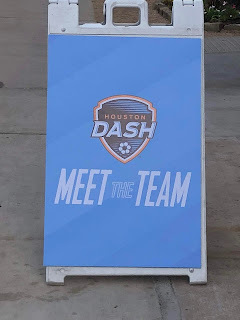 For tickets and additional information, visit HoustonDashSoccer.com/Salute.